Click here to order the book from Amazon.com. 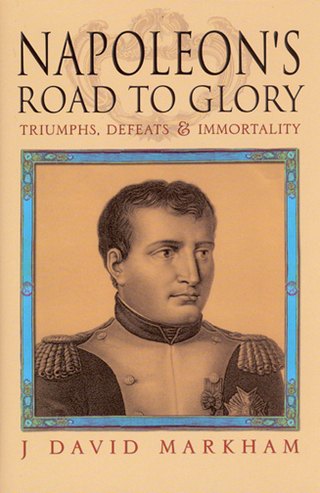 J. David Markham’s Napoleon’s Road to Glory: Triumphs, Defeats and Immortality (London: Brassey’s, 2003. 320 pages. ISBN 1857533275) belongs in every library. Based on excellent scholarship, it is a lively and very readable biography that looks at the social, political and military aspects of Napoleon’s fascinating career. Students and general readers will also gain from the many photographs of Napoleonic art and artifacts, all from Markham’s renowned collection. David Markham tells the story of Napoleon's amazing life in a way that all readers will find fascinating. His research is sound, his scholarship outstanding and his historical analysis well thought out; his account is a fine blend of scholarship and story telling. This book puts to rest some of the myths surrounding Napoleon, and belongs in the library of anyone interested in the subject. This book is to my mind a masterpiece of its kind. This easy read is fast paced, covers all the important facts, and is so well organized that it could be used as a general reference book... The focus is on how Napoleon came to power; how he ruled; and his long-term, nonmilitary achievements... The chapters are relatively short and packed with relevant information, and each one provides a superb summary of salient points. Markham has produced the essential, one-volume story of Napoleon’s rise and fall... a careful analysis of the results, consequences and legacy of Napoleon’s remarkable life. A brisk but comprehensive new biography by Olympia writer J. David Markham. His book is a sympathetic introduction to the man. Markham covers Napoleon’s remarkable triumphs and disastrous defeats in 300 succinct pages–which are nicely illustrated, by the way, with items from Markham’s own extensive collection of Napoleonic memorabilia. Napoleon’s Road to Glory provides a solid introduction to the man. A leading light in the International Napoleonic Society, Mr. Markham has produced a lively and lucid life that I would recommend to beginners in Napoleoniana. David Markham has given the man and the events a totally original and new spin that is a veritable tour de force. The book is well-written, well-researched and especially easy to read. It sounds like a pleasant conversation between friends and not thunder and lightening from a pulpit! Markham knows how to keep his audience’s attention and the story flows smoothly without the usual ups and downs. He asks the right questions and gives excellent answers and explanations. Napoleon’s Road to Glory is a most impressive accomplishment! David Markham has written a good concise biography of Napoleon that is historically accurate with interesting footnotes and bibliography. Napoleon’s Road to Glory is more than a military biography of the Emperor of the French. For while the military campaigns are covered quite well, the author's insight into the intriguing relationships between Napoleon and Josephine, his family, and his marshals, makes this book very enjoyable reading. It also provides a good contrast to Alan Schom’s recent anti-Bonaparte version of this period of history, in that Markham presents a combination of criticism and admiration of Napoleon. Napoleon’s Road to Glory is a well-written and well-researched biography that could easily replace Felix Markham’s classic biography of the French emperor to become the new standard biography of Napoleon I. One important way that David Markham, unlike the earlier Markham, improves upon the presentation of the older biography is by supplying numerous endnotes that provide readers with reference points for future research into certain key and fascinating aspects of Napoleon’s compelling life. Moreover, David Markham’s book does not suffer from the problems of obvious authorial bias that plague books such as Alan Schom’s Napoleon Bonaparte. David Markham has written a wonderfully descriptive book that is great fun to read; I couldn't put it down. This fine work effortlessly interweaves Napoleon's life as a political figure/ruler with his adventures and conquests on the battlefield and in the bedroom. Napoleon's Road to Glory, filled with unusual rare art, includes colorful revelations about his love for Empresses Josephine and Marie-Louise, as well as his relationships with a succession of mistresses. A terrific gift--perfect for collectors as well as anyone interested in a clear, comprehensive overview of Napoleon's life and career. Includes exciting, vivid descriptions of the "little Corporal's" victories at Marengo, Austerlitz and other battles. Just don't start reading this at bedtime, like I did, if you expect to get any sleep. David Markham’s book is the most readable and concise biography of Napoleon that I have yet to read. His knowledge of detail is very impressive. I find his the most enjoyable of all the books on the subject I have read. I would certainly recommend it to anyone who wants an excellent overview of this most fascinating historical figure. David Markham's new biography Napoleon’s Road to Glory is a well-researched and well-written account incorporating much new evidence. While clearly an admirer of his subject, Mr. Markham does not hesitate to be critical when necessary. A great addition to any enthusiast's library. Napoleon’s Road to Glory is easy to read, covers all the important facts, and is so well organized I could use it as a general reference book. Although the chapters are relatively short and can easily be read in a 15 minute sitting, each is packed with relevant information and provides a superb summary of the salient points. Napoleon’s Road to Glory is fast paced and a great read. Markham has the ability to take dry facts and spin a tale that will hold the interest of the most jaded reader. It is a welcomed balance to what seems to be an increasing number of anti-Napoleon biographies being published. A fast moving account that Napoleonic buffs will enjoy.